To be a unicorn is to acknowledge that you are magical and that the world is magical. 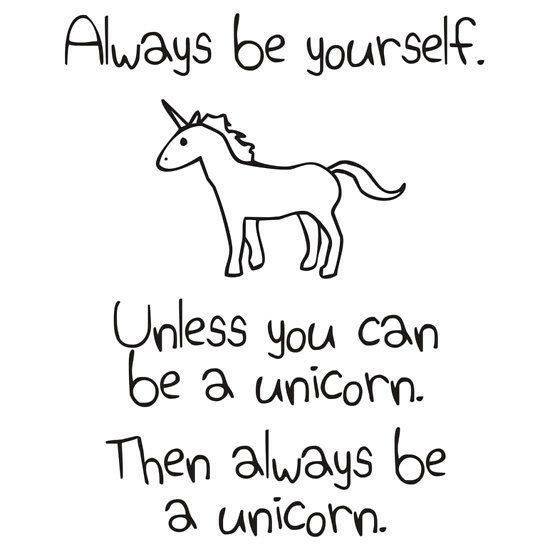 And, since this is true, being yourself is being a unicorn. Being magical doesn’t mean that the world is always safe or that things magically go your way, it’s just that you know that even in the darkest of times, a light abides, and everything turns out well, even if you die. Unicorns represent purity and the unicorn’s magic is only present to the extent of your purity. This is not intended to be moralistic, I’m not suggesting that you have to be an unsullied virgin or anything like that but you definitely need to be in harmony with yourself. As the song says ‘guilty feet have got no rhythm’, and magic is all about sensing, and weaving, harmonies and rhythms. Be yourself. Be a unicorn.